Figueres is Salvador Dalí's birthplace, an artist as headstrong as he was ingenious. Figueres would certainly not be as well known without its museum: the Dalí Museum in Figueres is of course the top attraction of the city. Thousands of people come every year to see works of the greatest representative of Surrealism. Book a trip here and visit Girona, Figueres and the Dalí Museum. Departure is 8:30 at Plaça Catalunya in front of the department store "El Corte Inglés" (large gray building). Please arrive about 20 minutes before departure. Booking is easy: on the upper right, please enter the number of people you would like to book for, select the date and click "Add to cart"
Within 48 hours after booking you will receive a booking confirmation with the voucher via e-mail. The voucher can also be presented on the smartphone. A free cancellation is possible up to 48 hours prior to the event. No cancellation fees, you will receive a full refund. A refund won't be possible in case of a later cancellation or a no show. During the Dalí Excursion, you will see very beautiful places: from Barcelona you will first drive to Girona, a city that invites you to stroll through the old town with its historical monuments, its medieval city walls, Romanesque and Gothic sights, baroque buildings and one of the best preserved Jewish neighborhoods in Europe. The tour takes about 1.5 hours. 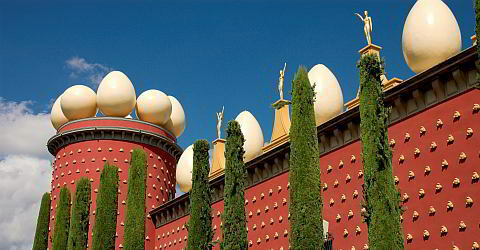 Then you will drive to Figueres and into the fascinating surrealistic world of Salvatore Dalí. Here you will visit the Teatre Museu Dalí (admission is included). Figueres is also a very attractive town with villas, shops and sidewalk cafes. Figueres and Girona are a perfect complement to any visit to Barcelona. This tour includes both a guided tour and plenty of free time to explore the two cities on your own. The Teatre-Museu Dalí is world famous. The museum was built on the remainings of a theatre burnt down during the Spanish Civil War. It was inaugurated in 1974. The museum in Figueres was designed and planned down to the last detail by Dalí. The first exhibition of the artist was in the lobby of the theatre. Some remains of the theatre have been preserved and integrated into the new building of the museum. The glass dome, under which the crypt and the Dalí's coffin is located, can be seen from afar. It's a special landmark of Figueres. Today, the museum houses over 1500 works of all kinds of techniques: paintings and drawings, photographs, sculptures, installations and engravings. Dalí bequeathed the museum to the Spanish state. He was buried in the museum. Dalí by Night: In August the museum is open at night from 22:00 to 01:00, there's a show in the patio, special lighting and a glass of cava as welcome drink. Those who can't get enough of Dalí, should visit the artist's skurille home in Portlligat, in which he lived until his death in 1989. On the way there, you will experience an impressive landscape of the northern Costa Brava. Visiting the house is only possible with booking in advance. A train goes from Barcelona's main station Sants to Figueres. The timetable can be found on the site of RENFE. Figueres is located about 140 km north of Barcelona. Whoever gets to Barcelona by car, usually drives on the A7 motorway anyway. This leads to Figueres and the way is signposted well. Drive along the coast on the C260 towards the village Roses. Shortly before a country road leads to Cadaques, after about 3 km you'll get to Portlligat. It is about 30 km from Figueres to Portlligat. Car Rental: With a rental car, you are flexible, it's easy and relatively cheap. Shown prices are per person, include VAT.